Kona's Africabike is a sturdy commuting machine that makes you feel good in more ways than one. If it wasn't enough that it's a pretty capable workhorse and fun to ride to boot, you can also relax in the warm glow of having done some good in the world too. The Africabike is precisely what the name suggests: a bike for Africa. Designed by Kona for the Bike Town project (http://konabiketown.com/) and devloped in partnership with pharmaceutical giant BMS and Bicycling magazine in the UK, Kona bill the Arficabike as 'the most important bicycle the company has ever developed', its mission to help health workers deliver antiretroviral drugs to HIV sufferers. Using the bikes means that the workers can be much more productive than they are on foot, meaning more people receive the treatment they need. In 2009 the program is looking to donates bikes to areas in Tanzania, South Africa, Burkina Faso and Mali. For every two bikes that are sold, one is donated to the scheme; so far over 3,000 bikes have been shipped. So what's it like? well, as you might expect for a bike designed to handle the unmade roads of sub-Saharan Africa, it's sturdy. 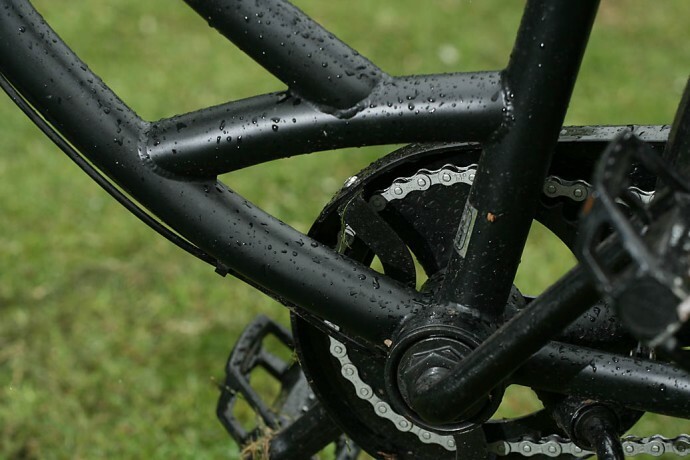 The frame is a step-through design in plain gauge Cromoly, the fork Kona's excellent and dependable P2. Bolted (literally) to that are hardy 26" wheels sporting excellent Conti 1.75" rubber and a Nexus three speed transmission – the bike is also available as a singlespeed. The wide, swept bars encourage a very upright position (whilst also allowing enough knee room to stand up for the climbs) and the steel seatpost and big saddle are comfy for the shorter trips the bike is likely to be making in the UK; given it's 19.05kg all in weight you won't be looking to do any century rides on it! Other features include a rear rack that's part of the main frame structure, welded in Cromoly tubing and sporting four bolt holes on the top so you can fit a shelf, or a box, or whatever you like, to the top. One thing to note is that a standard pannier won't work, as the tubes are too wide. There's more storage at the front in the form of a clever folding basket, which packs away when not in use and springs into place when you need it. It looks a bit flimsy but we've had no problems carrying some pretty heavy gear. 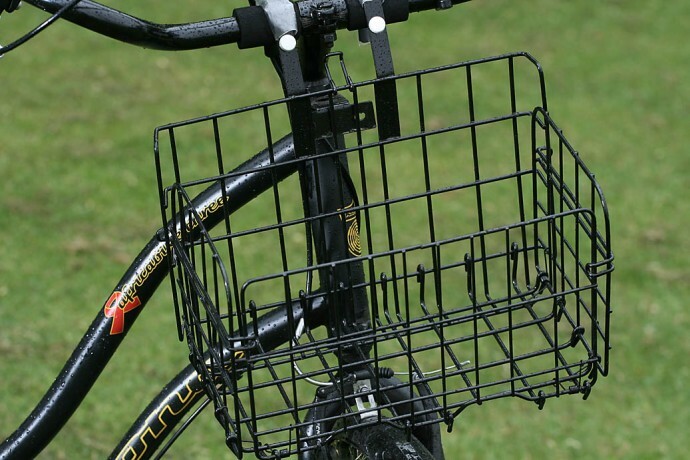 Mudguards and a rack are included for all-weather, normal clothes cycling. You'd expect a 19kg bike to be a bit of a sloth, especially given the upright position and the heavy wheel and tyre combo, and certainly the Africabike isn't a sprinter's tool but it's a surprisingly capable all-rounder. The steering is slow and a touch vague at low speeds, but at a cruising pace it's a very stable and comfortable bike. Despite the very low step-through there's no real flex from front to rear, and the bike responds pretty well to your input; you know you're not going to get a lightning quick response but it never feels like you're wasting energy. 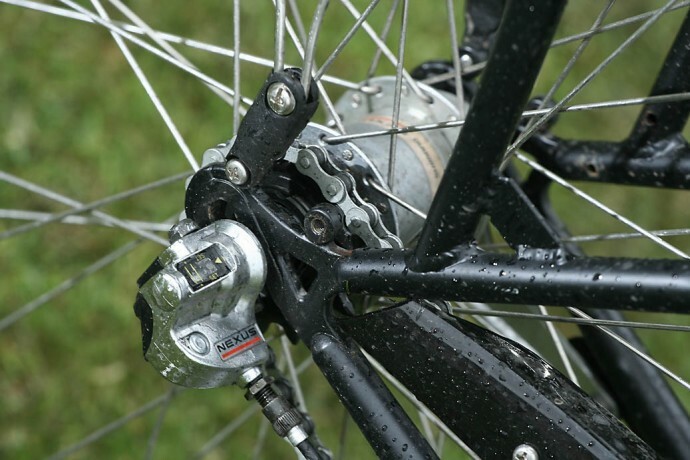 The three speeds run out pretty quickly on the downhill bits but it's not the kind of bike you pedal downhill anyway, just sit back, feather the rear coaster brake and enjoy the ride. Going up it's a lot better than you might think. Okay it's fairly slow going but the Africabike can get up some pretty serious hills, and it left me less out of breath on the commute home (2km at about 5%) than some fixeds and singlespeeds i've tried. And if you get too hot you can just sling your jumper in the basket as you go. The shape of the bars allows you to stand up to climb and you need to at times, but you'll be surprised at what it can tackle. GIven that it's designed to be used primarily on mud roads it seemed sensible to throw some light off road at the Africabike too and it handled it with aplomb. It's about as well behaved on towpaths and fire roads as any bike i've ridden, with added bonus that you can slam on the coaster brake and ride like a tail-happy hooligan. Over rougher stuff it's pretty capable too, though the low bottom bracket can get you into trouble and the tyres aren't great in the mud. Anything else not to like? well, the luggage capacity at the back is stymied a bit by the size of the rack tubes, in the sense that most standard panniers won't fit. Okay you can fit whatever you like with the bolts (we fitted a seat, although the standard wheelbase means it's only really good for kids unless you sit backwards) but for normal use you'll just want some bags. Also we managed to bend the seatpost, primarily because with a 1.90m tester there was a lot of it showing and it's not the greatest seatpost we've seen. Other than that, I've little but praise for the Africabike. We abused it and barely scratched it, left it out in the rain for weeks and it didn't rust. You can throw the nurse's lock through the wheel for quick trips to the shop and bring your goods back in the basket. As a daily life bike, it's pretty hard to beat, especially given the price and the fact that you're doing some good in the world to boot. African medical workers and anyone else that wants a tough, low maintenance, do it all machine - every home should have one. Very comfortable, a relaxed and smooth ride. Nope it was all spot on, although maybe the seat post could have been stiffer. they don't, but what you need is a set of panniers that sling over the rack and attach with ties, rather than separate bags. Basil (www.fisheroutdoor.co.uk) do a nice floral range (not joking) and there are plenty of others, they do tend to be towards the budget end of the range though. thanks for that, floral would be great, budget end.. perfect. cheers. I own this bike and am a fan but think they have a lot of kinks to work out. In the US market there are few European style bikes at this price since the fixed gear or single speed is taking over the urban market. 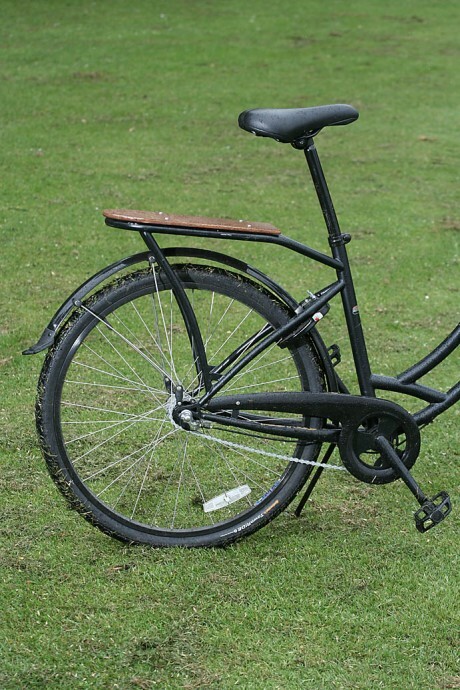 I bought some Panniers in Amsterdam and these fit across the back, but the rack is not high enough to give good pedal clearance unless I slide the pannier nearly to the end of the rear rack. I think the idea is a good one but they did not give much thought to the desire to actually transport more than a book or two in the front rack. 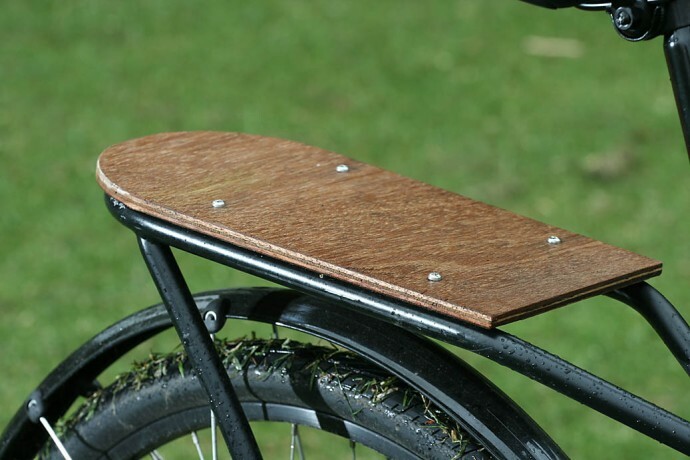 Perhaps the next Africa bike will take these things into account and get the geometry right or the company will design panniers to fit the bike and keep the rider from hitting the bags with his or her feet. I have this bike and I ride on it a lot of times. I bought it second hand in which used tires were fixed. But it was on good condition.